Electric power systems worldwide face radical transformation with the need to decarbonise electricity supply, replace ageing assets and harness new information and communication technologies (ICT). The Smart Grid uses advanced ICT to control next generation power systems reliably and efficiently. This authoritative guide demonstrates the importance of the Smart Grid and shows how ICT will extend beyond transmission voltages to distribution networks and customer-level operation through Smart Meters and Smart Homes. 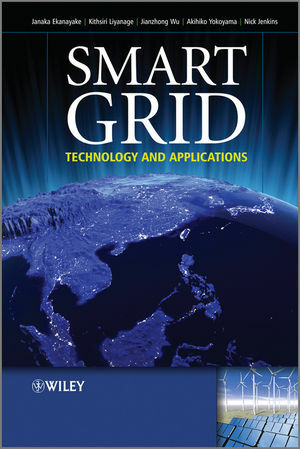 Clearly unravels the evolving Smart Grid concept with extensive illustrations and practical examples. Describes the spectrum of key enabling technologies required for the realisation of the Smart Grid with worked examples to illustrate the applications. Enables readers to engage with the immediate development of the power system and take part in the debate over the future Smart Grid. Introduces the constituent topics from first principles, assuming only a basic knowledge of mathematics, circuits and power systems. Brings together the expertise of a highly experienced and international author team from the UK, Sri Lanka, China and Japan. Electrical, electronics and computer engineering researchers, practitioners and consultants working in inter-disciplinary Smart Grid RD&D will significantly enhance their knowledge through this reference. The tutorial style will greatly benefit final year undergraduate and master’s students as the curriculum increasing focuses on the breadth of technologies that contribute to Smart Grid realisation. Professor Ekanayake is currently at the Institute of Energy at Cardiff University. As module leader on an MSc course, he teaches intelligent electronic devices, their applications and automation. He also teaches power electronic applications to power systems, flexible ac transmission systems and HVDC.Previous to this he was a Research Fellow at the University of Manchester. He was promoted to Professor in Electrical and Electronic Engineering at the University of Peradeniya, Sri Lanka in 2003. Professor Ekanayake has published over 25 papers in refereed journals and has co-authored three books in the area of wind integration. Dr Liyanage is Senior Lecturer in the Department of Electrical and Electronic Engineering, University of Peradeniya. Prior to this he served as Dean of the Faculty of Engineering, University of Ruhuna and as Director of the Information Technology Centre, University of Peradenyia. He has been with the University of Tokyo as a Visiting Research Fellow since 2008. He has served as coordinator of and consultant to several ICT and power generation projects. Dr Wu is a lecturer at the Institute of Energy, School of Engineering, Cardiff University. Privious to this he was a research fellow at the University of Manchester and Associate Professor at Tianjin University, China. He has been involved in several Chinese national research programmes, developing advanced software tools for distribution network operation, planning, for on-line security monitoring, assessment and optimisation for transmission networks. Professor Yokoyama is based at the Department of Engineering at the University of Tokyo. He is alsoProfessor in the Department of Advanced Energy at the Graduate School of Frontier Sciences He has co-authored two books, and is Chairman of PES Council of IEEE Japan. He is Vice Chair- man of the Japanese National Committee of CIGRE, and Vice President of Central Research Institute of Electric Power Industry of Japan. Professor Jenkins moved to Cardiff University in 2008 after ten years as a professor at the University of Manchester. He has contributed to ten books and is a Fellow of the IET, IEEE and the Royal Academy of Engineering. He was a member of Advisory Council of the CEU SmartGrid Technology Platform. Professor Jenkins is presently the Shimizu Visiting Professor at Stanford University.